THE Shay Catholic farming family has felt the full force of Queensland floodwaters – the shock of a rapidly rising river and watching their property going under, but also the generous spirit of a rural community. Andy and Susan Shay, their four children and two farm dogs huddled together in the dark for three hours on the back of a truck as waters from ex-Cyclone Debbie rapidly engulfed their farm on the outskirts of Beaudesert, 70km south of Brisbane. They were preparing to climb from the truck onto their roof when an emergency rescue team plucked them to safety. “My family has been here for generations and we have never seen anything like the force of this water,” Mrs Shay said. The next day, the family returned to their mud-soaked farm to find parishioners from St Mary’s Church, Beaudesert, arriving to pitch in to help clean up. “They’ve just been extraordinary,” Mrs Shay said. “All the families that attend our regular Mass at St Mary’s have been out here for the whole weekend helping us to clean up. Parish priest Fr Michael McKeaten also paid the Shay family a visit to offer support. The flood has had a big impact on his parish, one of the largest in the Brisbane archdiocese. “People here are very resilient,” Fr McKeaten said, assessing the mood of his community. 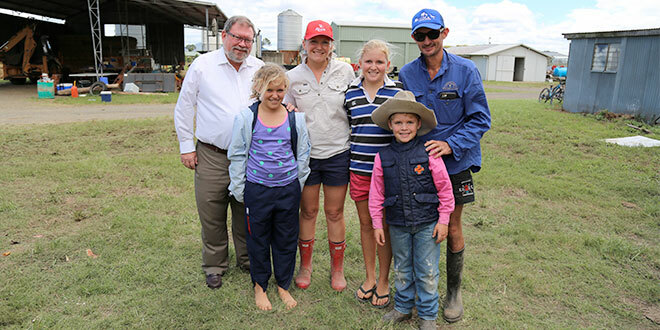 The Shays are raising their four children as the fourth generation of a farming family on their Bromelton House Road property, which runs along the banks of the Logan River. In the wake of Cyclone Debbie, they were shocked at how quickly floodwaters rose to engulf an entire farming community. “It all happened so suddenly,” Mrs Shay said. There was another surprise as a fast-water rescue dinghy delivered the Shays to higher ground – a TV crew was waiting to interview the family live on the nationally broadcast Sunrise program. “There was a time when it was pretty scary because it was still dark, but they’re all good kids,” Mrs Shay told Sunrise. “We’ve got a long road to get everything back to operating. The Shays have set up a poultry farm and run cattle on the site of an old family dairy of Mrs Shay’s parents Brian and Judith Manderson. Their poultry sheds usually house 240,000 birds, but the chickens had been sent to market. About 100 head of cattle from the Shays’ farm fled the floodwaters to higher country. Slowly the cattle have returned. The Shays are among more than 5000 people rescued by the Queensland SES after Cyclone Debbie struck land near Airlie Beach on March 28 and caused widespread flooding and damage. A massive clean-up was also underway in nearby Logan, which was inundated downstream from Beaudesert. In Beenleigh, St Patrick’s parish priest Fr Joseph Kanatt inspected the damage at Trinity College. The covered basketball courts and sportsfields were covered in mud as floodwaters receded, but classrooms built on higher ground were unscathed. Surrounding streets close to the river were muddied, and had mounting piles of debris and rubbish. Queensland Premier Annastacia Palaszczuk said it could take months for the state to recover from the storm, with the financial cost still to be fully assessed. 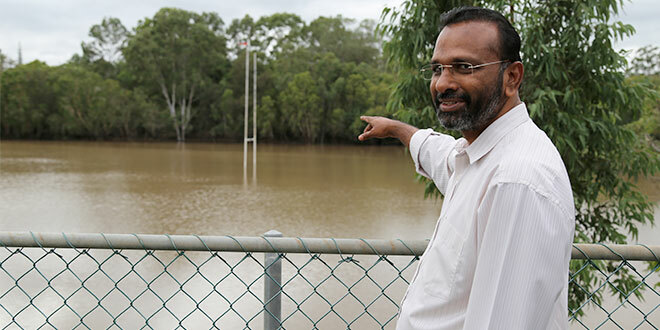 Rained out: Beenleigh parish priest Fr Joseph Kanatt overlooking the flooded oval at Trinity College, Beenleigh. Photo: Mark Bowling.